All of us who love Bullough’s Pond know the gift the pond gives to us every time we see it. Bullough’s has a way of making even one’s darkest days brighter. It is a calming, reassuring and joyful place with the power to lift one’s spirits and make all things seem possible again. Now is the time to give something back to Bullough’s Pond, something even more substantial than one’s annual contribution, something that lasts. When a colonial miller, Lt. John Spring, dammed a local brook in 1664, he created the pond to power his gristmill, and could not have foreseen what a rare oasis of tranquility the pond would become in our time. In his time, the pond was called Spring’s Pond, and later Pearl Lake, and finally Bullough’s Pond, after John Bullough, who purchased the mill. Over the centuries, Bullough’s Pond has seen service as a source for icebox blocks and as a destination ice skating venue. Now the pond is a place for kayaking, fishing, running, bird watching, painting, model yacht sailing and peaceful walks. It’s a little bit of nature and a lot of beauty in our neighborhood. It’s a treasure that we must protect and enhance. 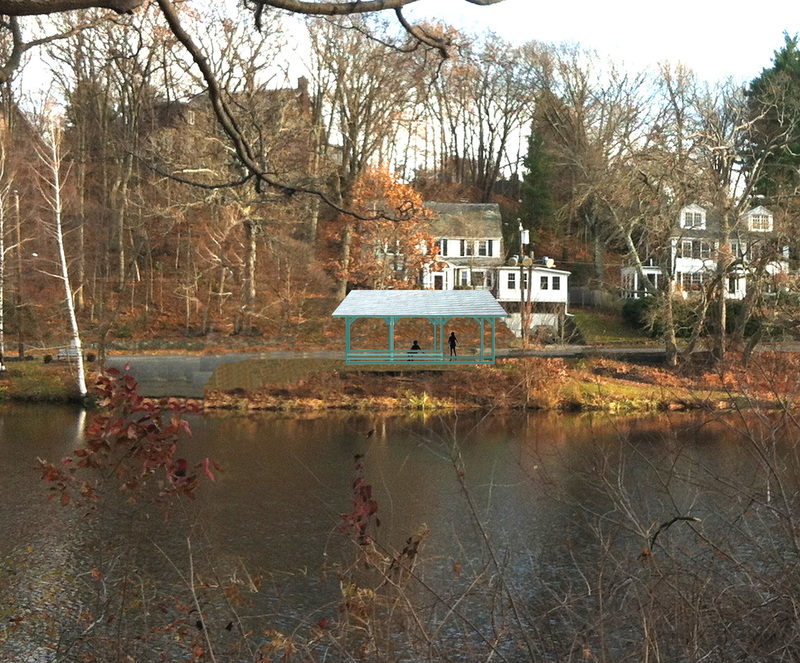 The Association seeks to make needed major improvements to the pond, by rebuilding the dilapidated former warming hut and damaged asphalt boat ramp to create a beautiful multi-use pavilion with a renewed boat ramp and landscaping. The Association will design the site with the input of the neighborhood and in conjunction with the City. The repurposed structure will provide a sheltered place for people to enjoy the pond as they sit, sketch, bird watch, listen to a lecture, practice yoga, or just pass the time. 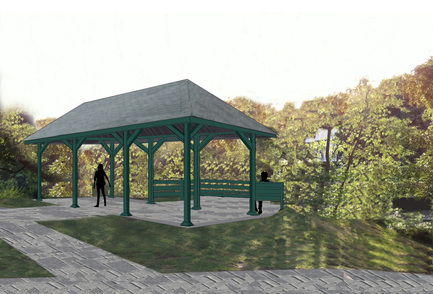 The pavilion will open up the view to the pond while providing shelter from the sun or rain. See below for some very preliminary conceptual drawings of what a repurposed pavilion could look like. The final design and functionality will be developed in conjunction with the neighborhood and the City’s Parks and Recreation officials. Online: It’s simple and easy to make a gift through the Donate page of this website. By Check: You may prefer to send a check made out to the “Bullough’s Pond Association” to P.O. Box 600669, Newtonville, MA 02460. Please make a note that your gift is for the 350th Anniversary Campaign. Contact Us: Please contact the Bullough’s Pond Association board if you are interested in making a large gift. Use the Contact Us option on this website, or email us at webmasterbulloughspond@gmail.com. BPA President Marilyn Campbell or BPA Treasurer Joseph Tischler will get in touch with you promptly. “Bricks for Bullough’s”: Help us pave the boat ramp and the pathway to the pavilion with elegant granite bricks. Buy a brick for $100 and the Association will add your name to a plaque at the site acknowledging all contributers to the campaign, and to the “Bricks for Bullough’s” program specifically. Simply note on your check or online payment that your $100 gift is a “Brick’s for Bullough’s” contribution. 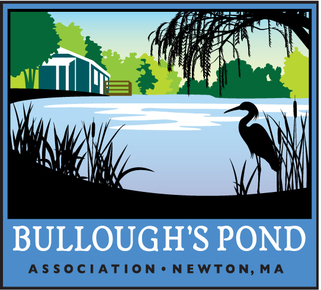 Tax Deductible: The Bullough’s Pond Association is a registered 501(c)3 charity and your contributions are tax deductible.